The second building of Villa Nymphaeus is three luxurious modern buildings with autonomous ventilation and air conditioning system. 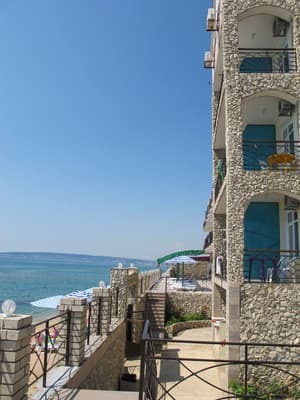 The building is located directly on the Black Sea coast with access to a sandy beach. Attentive guests are offered comfortable rooms with all amenities. Its name comes from the city of Nymphea, which was founded in the 6th century BC. in 17 km from modern Kerch. There are many cozy bars and cafes on the coast. The chefs of Villa Nymphaea will delight guests with a wide variety of dishes. 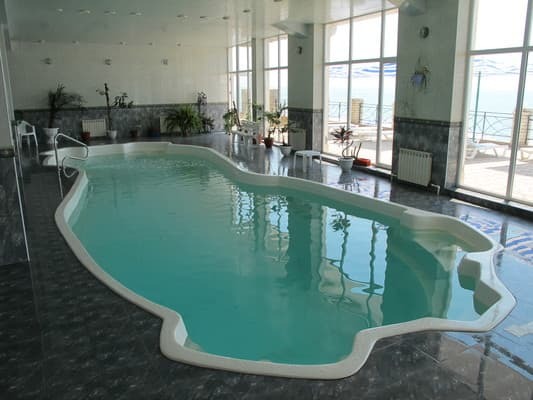 At guests disposal: Wi-Fi, a swimming pool with sea water, sun beds, sauna. There is also a children's playground for children. PRICES MAY CHANGE, YOU NEED TO UPDATE THE OPERATOR'S INFORMATION! 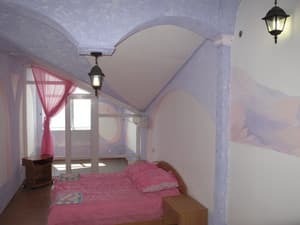 Description of the room: One room includes a bright room, which is equipped with two beds, and there is also the possibility, if necessary, to install additional space for the child. Description of the room: Two-room is represented by a living room and a bedroom. The living room has upholstered furniture, coffee table and TV. In the bedroom there is a double bed, a table and a wardrobe. The room is designed for simultaneous accommodation of four people. 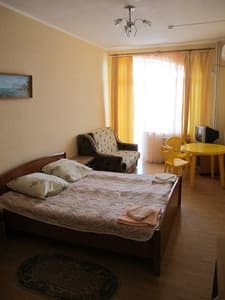 Description of the room: Three-room suite consists of two separate bedrooms and a large living room. Each of the bedrooms has air conditioning. This room accommodates six adults. 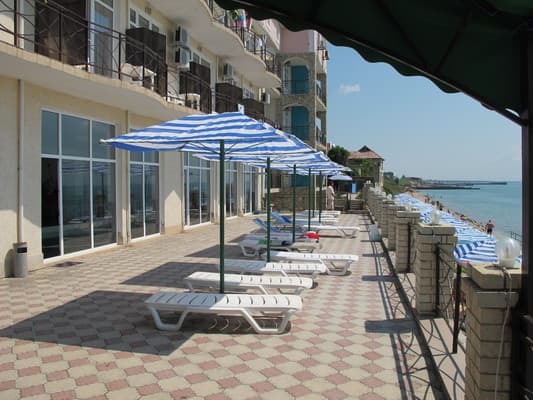 The second building of the villa "Nympheus" is located in the village of Primorsky, on the shore of the Feodosiya bay near the sandy beach. 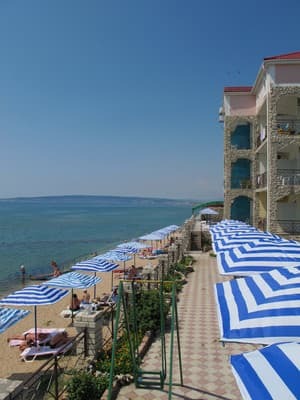 Primorsky is a suburb of the ancient city of Feodosia, which is more than 25 centuries old. 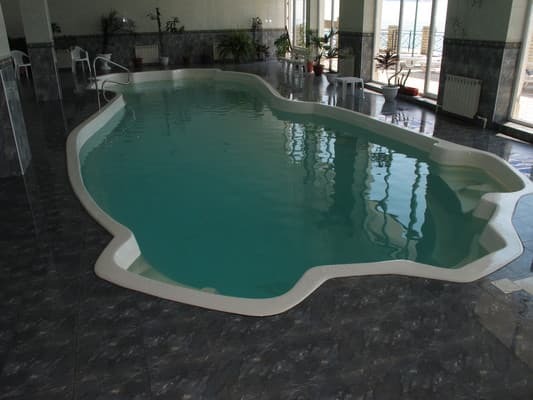 By prior arrangement, the hotel owners organize a transfer from Simferopol, Dzhankoy and Kerch. Buses and fixed-route taxis Nos. 4, 4A, 4B, 4D will be delivered from Feodosia in 20 minutes.